I am so pleased that my mojo has returned. I hope that all of those bloggers who left a comment that were looking for theirs have also found them. It didn't say where it had been or even who it had been with but I was just pleased to see it return. Look at the big pile of stitcheries that I have completed. 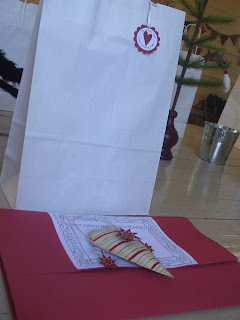 I have also finished my stitchers angel gifts and they are on their way to my angel as we speak. Today was the Quilted Crow's Christmas Gathering with guest tutors Rosalie Quinlan and Leanne Beasley which just happened to fall on Halloween. 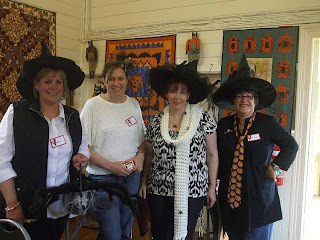 The Bloggers were challenged to come along with a Halloween theme by Jo who rather likes "Halloween". 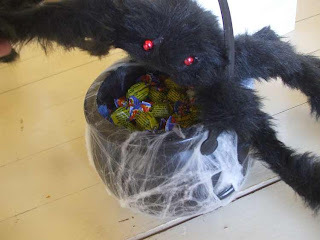 Cathy came along in the spirit of things and brought along her spider friend and also some lovely treats in her cauldron. Sarah, Leanne, Lisa, Christine & Helen were just some of the other bloggers who attended. 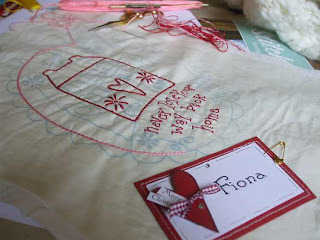 As usual it was a fun day with a whole lot of eating, chatting and giggling and not a lot of stitching. 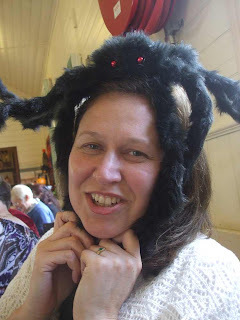 Jo with Cathy's spider as a nice head piece. There were lots of lovely projects. I took many photo's but to cut down the size of this post I thought I would show you the 3 that i have chosen to make. 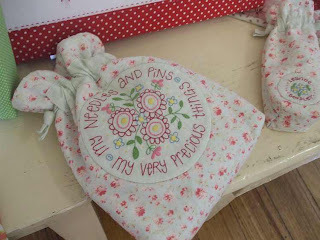 This is a lovely stitching bag from Leanne. I purchased the kit to make it. 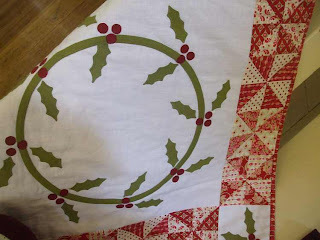 "Leonie" from the Quilted Crow designed this lovely Christmas Quilt. I purchased the kit to make this also. This is the project from Rosalie that I decided to start on the day. It is mounted on a canvas and will be hung on my bedroom wall once it is completed. This is all that I achieved on the day in 6 hours !! Jo - showed me her technique for chain stitch - I think I am loving chain stitch !! And what would the day be without oodles of purchases??? 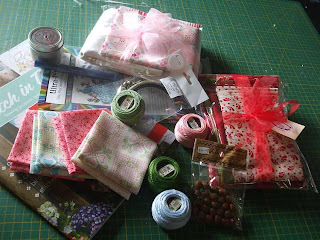 I purchased lots of goodies including 2 kits, rusty bells, perle cottons, punch needle kit, fabric, Rosalie's new book "A Stitch In Time" which she kindly inscribed for me and a few other bits and pieces. It was a lovely day and was just what I needed !! 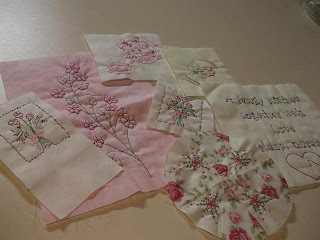 I am off now to have dinner and then to spend some more time on the stitchery that I started today. Wow darling, looks like you had a terrific day! Wish I could have been there with you! Yay for you!!! Your mojo is back :o)!!!! Looks like you had such fun, would have loved to have been there with you too. Lot's of lovely goodies you brought home too :o). 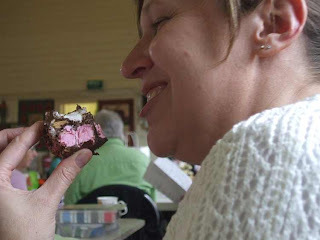 Mmmmm, Rocky Road .... I like Rocky Road :o)!!! Fiona so glad that your mojo is back. Looks like it was a fantastic day wish that i could have been there with you also. Don't forget to show us all the finished stichery it looks great. Thrilled your mojo has come home Fiona, its a pain when it goes visiting elsewhere isn't it. What a wonderful fun day it looks like you had with the girls, Rosalie's one you have started if gorgeous. I am thrilled you've got your mojo back! That is beautiful work! Fabulous! Big hugz+ for you! Great to see that you had a good day at the Gathering. Love those photos of Jo - looks like she had a good time too! And yee-hah about the Mojo returning. looks like a great day mate...well done! There is nothing like a good workshop to get the mojo flowing! I'm glad you went and were inspired!! I love all your purchases -especially the wall hanging stitchery that you are working on...I don't know how to do chain stitch and it looks lovely....you should give us a little tutorial....come on....inspire us! 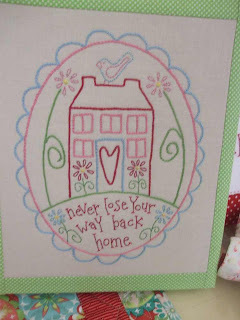 Take care and keep stitching! Nothing like a stitching day "with the girls" to uplift the mojo. So glad you had some fun and.....nice treats! 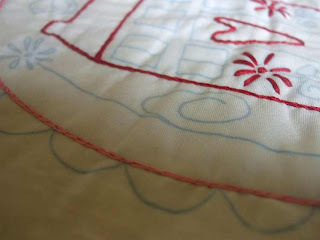 Chain Stitch technique ??? Can we see a tutorial on that when you have absolutley nothing to do darling.......lol...ok..next year will do! Love the kits you bought...very envious Fee darling! LOL!! I feel like mine has made a comeback too....YAY!!! It was a great day, thanks for sharing it with me!! Looks like your mojo came back and brought all its friends, lol! WOW you got a lot done. I love all your purchases, especially that last stitchery - how sweet is that! Nice to meet you Fiona. You did more stitching than me! PS. Your puppy is very cute. HHmmm showing me doing what I love to do "Eat" especially sweets!! Always lovely to spend a day with my stitching buddies and having a few laughs!